Preheat the oven to 375 degrees F with the rack set in the middle of the oven. Grease a 9 or 10 inch round cake pan with softened butter or vegetable oil cooking spray. Note that I used a metal, non stick pan. (Alternatively, grease a 9 inch x 13 inch rectangular pan. Note that I used a metal, non-stick pan.) Trace the bottom of the cake pan onto a piece of parchment paper using a pencil. Cut the shape out of the parchment paper and place it into the bottom of the greased cake pan. In the bowl of an electric stand mixer fitted with the paddle attachment, beat the eggs, cream, and melted butter together on medium speed until mixed. Then, on the lowest speed, stir in the cornmeal, sugar, baking powder, and flour until combined. The batter will be thick. Alternatively, if you don’t have a stand mixer: In a large bowl, stir together the cornmeal, flour, sugar, and baking powder until well mixed and set aside. In a separate large bowl, whisk together the eggs, cream, and melted butter. Add all of the dry ingredients to the wet ingredients and gently stir or fold until the ingredients have been incorporated. The batter will be thick. Pour the batter into the prepared cake pan and smooth out the top using a rubber spatula. 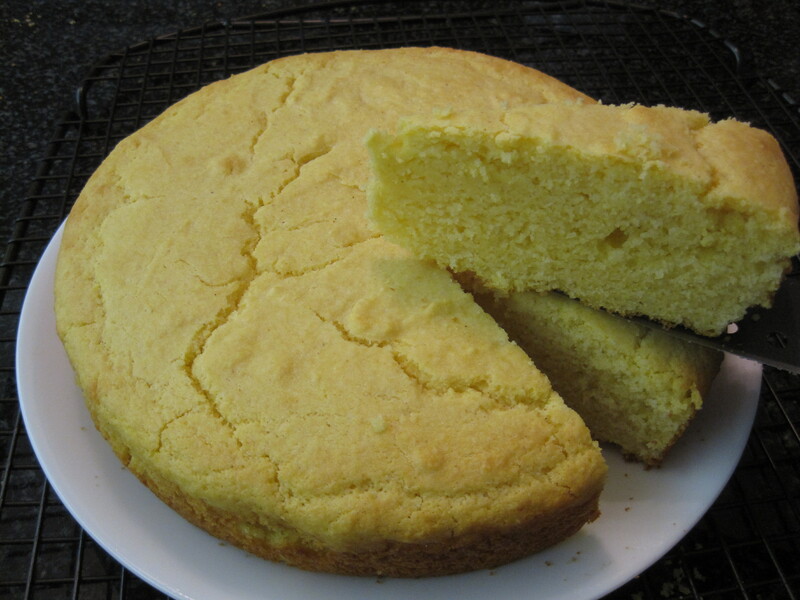 Bake until the cornbread has risen, the top turns a light golden brown and starts to crack, and until a toothpick inserted into the middle comes out clean or, preferably, with a few crumbs attached to it. This should take approximately 30 minutes if you use a 10 inch cake pan, approximately 40 minutes if you use a 9 inch cake pan, and approximately 20 minutes if you use a 9 inch x 13 inch pan. Check 10 minutes prior to the expected finished cooking time, as it is very important not to over bake the cornbread. Once the cornbread has finished baking, carefully remove it from the pan and transfer it to a wire rack to cool. Don’t forget to remove the piece of parchment paper as well. 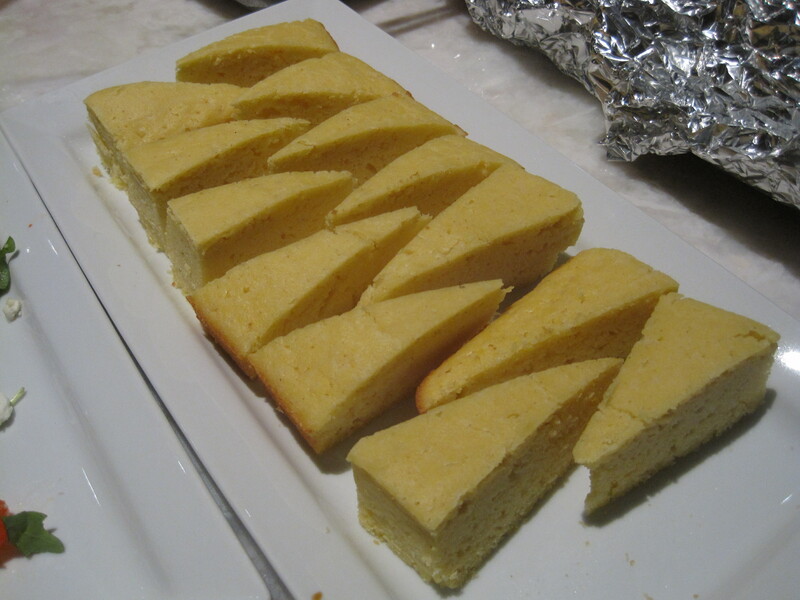 For serving, simply cut the cornbread into wedges. This can be served warm or at room temperature. Completely cooled leftovers can be stored well covered at room temperature for 2 or 3 days or for longer in the refrigerator. Also, this freezes well. Cornbread can be reheated in a preheated oven (325 degrees F), covered loosely with aluminum foil for 15 minutes. It is so nice to hear from you, Soad! Please let me know what you think of it!! I found it to be more than a thick batter, it was more like a cookie dough. I had to make many alterations to the recipe to make it at least spreadable. Added some more sugar as well. Thanks for writing! I wonder if the additional sugar was enough to make your batter too thick. I hope that it still tasted great with your alterations!